Murchison Falls National Park regarded as Uganda’s largest protected was nowhere until 1952 when 3,840km2 of land in the North West part of Uganda were established as a national Park. Perched on the northern extreme of the western arm of the great East African rift valley, Murchison Falls National Park is 80km from Masindi town which is the largest town in the sub region and 311km2 from the city of Kampala, the Uganda’s capital. It adjoins the Bugungu and Karuma wildlife reserves to form the greater Murchison Falls Conservation Area covering an area of 5, 308 Km2. The park is bisected by the world’s longest river which sparked early exploration movement in the Roman times in quest of its source. This is called River Nile which divides the park into the northern and southern sides leaving a historical land mark with in the park that was later to give the park its nomenclature and this none other than Murchison Falls. The Murchison Falls in Murchison Falls National Park which were explored by the Sir Samuel Baker on 14th March 1864 on his Nile expedition from the north was named after the then president of the Royal Geographical society in the names of Sir Roderick Murchison. The Murchison falls mark the Nile River as it makes the journey through the park for over 115km and the falls are considered to be the most powerful in the world due to the extent of force that is exerted on the flowing water while narrowing its self to pass through an 8m gorge before falling 43m below to what has been noted as Devils Cauldron surrounded by a plume of spray and a roaring sound marked a trade mark rainbow. Besides Murchison Fall, the park is a habitat to four of the big five though it had all of them before Rhinos were poached to extinction. Others like lions, buffaloes, elephants and leopard still exist. Fortunately, Rhinos were reintroduced and are being breed in the nearby Rhino Sanctuary with plans of reintroducing them to the wild after 30 years. 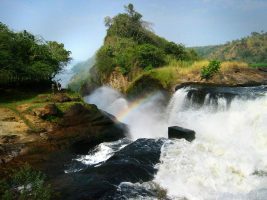 The altitude of Murchison Falls National Park is considered to below according to the standards of geography of Uganda falling between 619m – 1,292m with the lowest point in Uganda located in the Victoria Nile Delta. The park receives an average rainfall of 1,085mm and the amount is considered to low compared to the tropical rainforest of south western Uganda though it is in similar to other east African savannah ecosystems. Its vegetation is greatly marked by rolling savanna combretum in the northern sector dotted with stands of borasus palms while the river line vegetation marks the banks of river Nile. The southern sector is marked by dense woodland and thicket and dense forests in some areas. Murchison Falls National Park in Uganda is the second most visited Uganda safari park after Queen Elizabeth National Park. Concerning wildlife, Murchison Falls National Park contains 76 mammal species, 460 bird species and 19 unconfirmed species and 53 raptor species that combine to make your safari tour in Murchison falls National Park memorable. The species of mammals in Murchison include; bushbuck, defassa buck, bohor reedbuck, warthog, oribis, side-striped jackal vervet monkeys, olive baboon, localized patas monkey, leopard and spotted hyena The Rabongo forest contain counts of black and white colus monkeys, chimpanzees and other forest primates. The park is also a home to the rare and endangered shoe bill stork. The Murchison Falls are regarded as the great landmark to ever mark the Nile course as it makes its way from Lake Victoria to Mediterranean Sea. The Nile River which is also the world’s longest river are considered as the greatest natural landmark to ever happen on the course bisects Murchison Falls National Park into two sections of the northern and southern sectors for a distance of 115km. During its flow, it comes across great impermeable rocks that only give it a narrow passage of 8m flowing a plummeting for 43m distance hitting the hard rocks thus producing a roaring sound and a plume of spray. Its pressure as the water fall into the Devils Cauldron produces a trade mark rainbow. 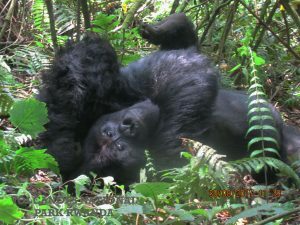 This is a great attraction you can have while on Uganda safari. It is very thrilling hear that 300 cubic meters of water that is pumped out of Lake Victoria which is the largest tropical lake in the world per second is squeezed to pass through a ravine that is below ten meters in width. With its historical encounter with the Roman times explorers like Sir Samuel Baker who named after Sir Roderick Murchison the then President of the Royal Geographical Society of London. Though the name was changed to Kabalega (who was the famous King of Bunyoro known for resisting British rule) during Amin’s era, it was later reversed to the former after his downfall. Besides Murchison water falls, the park has 76 species of mammals including four of the big five of the land animals. These include; a herd of buffaloes, elephants, pride of lions, leopards while Rhinos thrive in the adjacent Ziwa Rhino Sanctuary that can be visited en route to or from Kampala to Murchison. The park also contains giraffes which are found in only Murchison and Kidepo in Uganda The park has other counts of wildlife including; Uganda Kob, Jackson’s hartebeest, bushbucks, Oribis, waterbucks, olive baboons, warthogs, vervet monkeys, white and black colobus monkeys, blue and red tailed monkeys, patas monkeys and counts of Chimpanzees in the adjacent Budongo forest. The Nile River holds counts of Nile crocodiles and hippopotamus. The varied environments of Murchison Falls National Park shelter arrange of birds that thrive in different habitats. The birds count to 451 species and 19 that are unconfirmed thus attracting a range of birders to undertake safaris to Uganda. 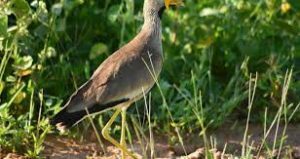 Some of the bird species that can be encountered in this park include; Goliath heron which is the largest in Uganda, the shoebill stork which are rare and endangered, the grey crowned crane considered as the national bird of Uganda. Other bird species include; Blue-headed Coucal, Swamp Flycatcher, Squacco Heron, Sandpipers, African Jacana, Denham’s Bustard, Black-billed Barbet, Abyssinian Ground-Hornbill, Black-headed Gonolek, Pied Kingfisher, Eastern Grey Plantain-eater, Piapiac, Giant and Malachite Kingfishers, Weaver Birds, Silver bird, African Quail-Finch, White-browed Sparrow Weaver, Red-throated Bee-eater and Speckle-fronted Weaver. 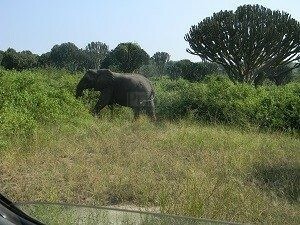 The game drive in Murchison Falls National Park is one of the rewarding encounters that you can ever have while on Uganda safari. The activity exposes you to a range of wild game including; elephants, buffaloes, lions, leopards, Jackson’s hartebeest, Rothschild giraffes, Uganda kobs, water buck, oribi among other species. 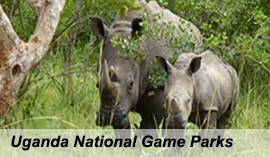 The game drives are usually carried out in the open savannah landscapes of the northern sector with in the designed tracks of Buligi, Albert and Victoria. The area between Paraa – Pakwach road and Victoria Nile Delta present great wildlife concentrations. The 7km transfer from Paraa takes you up to junction where you will turn left to enter Buligi track or turn right to Wankwar gate and Chobe. The Nyamsika gorge which is situated within few Kilometers from the junction offers good sights of wild game as it gathers to drink water while the Nyamsika cliffs are shelter to seasonal colonies of bee-eater bird species while the shallows are ideal for encountering the Egyptian plover. In the southern sector, the open area along Sambiya Karuma road offers impressive sights of Jackson’s hartebeest, Uganda kob, oribi, waterbuck and baboon. The rarely sighted are elephants and lions. The game drive activity is best done in the morning at 6:30am and in the evening at 4:30pm local time and it lasts for 3 – 4 hours. If you slept in the southern side, you have to catch up with the ferry crossing at 7am. Murchison Falls National Park with its 451-bird species and 19 that are unconfirmed offers ideal birding encounters. The game drives and the launch cruise both offer birding encounters. Alternatively, it can be encountered as full day activity of its own. 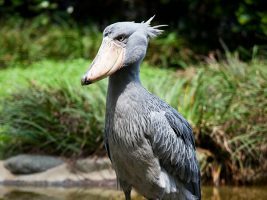 The Nile banks provides encounter with the rare and endangered shoebill stork that is easily spotted in the months of January and March. The Murchison plains present sights of Marabou Stork, Abyssinian Ground Hornbill, Secretary Birds, Open-billed Storks and Widow Bird and Black-bellied Bustards. Other bird species that make birding encounters thrilling in Murchison while on Uganda safaris include; White headed vulture, grey crowned crane, Senegal thick- knee, Black headed lapwing among others. The forests of Rabongo and Kaniyo-Pabidi also provide good birding encounters while Nyamsika cliffs are home to Swallow-tailed and Red-throated Bee-eaters. The combination of these makes birding in Murchison Falls National Park interesting. Murchison Falls National Park is traversed by the Nile River for 115km. After the powerful Murchison falls, the waters of the Nile lay in at most calmness as they approach Lake Albert (Victoria Delta) providing a thrilling ground for a launch trip. The launch trip commences from Paraa jetty and goes up to the bottom of the falls allowing Uganda Safari undertakers to view Nile crocodiles, Hippos, birds like the rare shoe bill stork, Goliath heron, saddle billed stork, African fish eagle, pied and malachite kingfishers, African jacana, African skimmer and piacpiac, wild game drinking on the river side including elephants and the lush vegetation that front the river including acacia woodland, mahogany stands and borasus palm. The Nile launch trip takes 3 hours and is best done in the afternoon commencing at 2pm. The encounter to the top of the falls is also very thrilling. 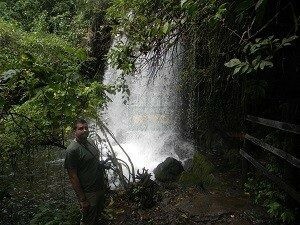 The powerful falls in the world would be explored on Uganda safari by reaching at its top. This can be done by taking a 15km road that branches off from the main Paraa – Masindi road near Sambiya River Lodge and because of steepness and roughness of the road, it requires keen navigation. The top of Murchison falls is marked by a foot path that trails to the botoom of the falls following the Nile as it crushes its self on the impermeable rocks that have only given it 8m gap to proceed with its course. You can also take a 20 minute from the view point to a saddle that will in turn offers you the views of Murchison falls and Uhuru falls in the north. The exploration of the waterfall takes approximately 2 hours and is best done in the afternoon. There are a range of tribal groups that surround Murchison Falls National Park including the northern Nilotic tribes and southern Bantu tribal groups. 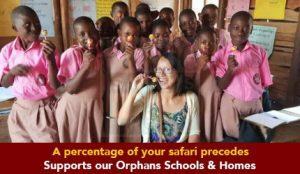 These people have got varying traditions that are very interesting to encounter while on safari in Uganda. The local dance groups are available to give a taste of this tradition suiting your limited time. The example of these is Mubako energetic dancers who are good at music dance and drama and always perform in the evening at the safari lodge forest. You can also take a village tour to explore the local community setting. The River Nile waters can also be ideal for sport fishing encounter while on safari in Uganda. They offer ideal encounter to fish Nile perch. Sport fishing is done at specific gazetted areas and can be done all year round and throughout the day. However, local fishermen assert that the outcomes are interesting in the morning and evening which holds some truth for the sake of predator fish species. This is rejected by the technocrats like Arthur de Mello who points out that fishing can be done at any day time or night provided the waters and weather are clear and warm. The low water volumes and clear water offer impressive sport fishing encounter in Murchison National Park between Mid-Januarys to Early April. There is also provision for nature walks in Murchison Falls National Park. There are walks in the forests of Kaniyo Pabidi and Rabongo offering sights of birds and primates. There are other nature walks along the Victoria Nile Delta that lasts 2 – 4 hours with probable views of spotting shoe bill stork. 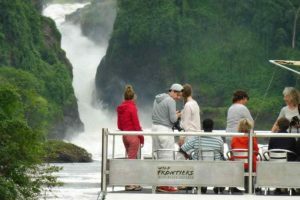 The 45m hike to the top of the falls offers rewarding sights of the powerful Murchison falls as it crushes its self on the hard rocks that mark the 43m long pass that is 8m in width. This is done when travellers leave the launch after approaching the bottom of the falls and hike to the top on foot. 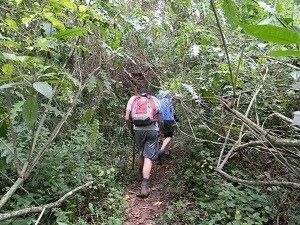 There are also other short treks that commence from Sambiya River Lodge ideal for birders and nature lovers. They normally last 1 ½ – 2 hours. This is positioned on the banks of the Nile overlooking the chilly dense thicket of Karuma wildlife reserve. It is a top-notch luxury accommodation establishment that is ideal for company retreats and honeymooners. Its serene environment makes it ideal for relaxation and breaking the daily work routine. The panoramic views coupled with the roaring sounds of the Nile rapids create a sense of satisfaction. Chobe Safari Lodge offers its accommodation in 21 upmarket tents, 36 features 21 luxury tents, 36 well-designed guestrooms, four (4) suites and a presidential cottage. It is located in North West of Uganda on the Eastern Bank of the Albert Nile. Its tastefully furnished rooms offer comfort, style and serenity. The lodge provides the best opportunity for game viewing in the park as it in the northern bank where elephants, buffaloes and other wild animals can be seen roaming around the lodge early in the morning and late evening. The lodge can be easily accessed via gate of Tangi. It has 46 spacious rooms which can be modeled to suite either twins or a double bed. The large lounge area and surrounding grounds give guests a grand-stand view of Lake Albert and the Albert Nile. Paraa Safari lodge is positioned on the banks of the Nile and came into existence in 1954. Accommodation is offered in its 54 luxury rooms featuring private balcony and in built washroom facilities. It is categorized in form of cottages, suites, twin, double and single rooms. The lodge has a swimming pool overlooking the meandering River Nile below which acted as the base for African Queen Movie shooting – a production of Hollywood. Sambiya River Lodge is situated only 20 minutes from the top of the magnificent Murchison Falls. It is the seamless location for those who want to enjoy the serenity of unharmed Africa, untouched by mass tourism. Guests stay in any of the 26 double rooms designed as individual and family thatched cottages which have screened doors & windows, en suite bathrooms, mosquito nets, fans and a veranda to relax. Ten basic bandas are also available for guest accommodation. Red Chilli is a budget establishment in the southern side of Murchison Falls National Park about 500m from the Paraa ferry crossing area. The Red Chili has basic facilities but designed to give you comfort. 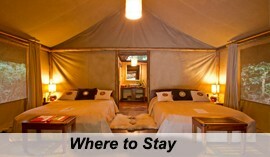 The accommodation is offered in safari tents, bandas and camping option. It also features bar and restaurant, modern washrooms with provision for the disabled clients, security lighting, and cooking area. The bar is open for guests from 6.15am until midnight while the meals time is 7:20am – 10:30am for breakfast, 11:30am – 3pm for lunch and 6:30 – 9pm for dinner. The breakfast and lunch are always served on Alarcarte basis. Packed breakfasts require placing an order by 8pm the previous day. Situated near the entrance to Murchison Falls National Park, Shoebill Campsite presents good sights of the blue waters of the River Nile, clear skies and cozy atmosphere while undertaking a wildlife safari in Uganda. Relax at the camp fire after a busy day of game drive or at the falls listening to the calls of hippos and watching the stars. Guests must provide their own tents. Guests can choose to prepare their own food if they bring their equipment, or eat at the splendid Nile Safari Lodge restaurant just two minutes away on foot. They also have an admittance to the Lodge’s swimming pool overlooking the river. Guests provide personal tents and equipment for cooking. Yebo Safari Camp is located in the Murchison Falls National park. This simple lodge is set back from the southern bank of the Victoria Nile just outside the western boundary of the main reserve. 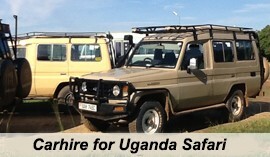 Uganda wildlife Authority also operates a campsite that provide enormous accommodation opportunity for camping travelers. The eco-lodge is located in the forest reserve of Budongo at the eco-tourism site of Kaniyo-Pabidi. The Budongo eco-lodge is a luxury establishment nestled at the center of this mature tropical forest and it offers its accommodation in five (5) private cabins that are sanely situated in the forest. The cabins feature twin or double beds and a living area within built bathrooms and eco-toilet. The Eco-lodge also has four (4) dormitory rooms with each room containing two (2) double decker beds thus having four (4) people occupancy capacity. The facility also has four dormitory rooms suited with two double decker beds in each room with maximum of four (4) people and shared washing facilities. The restaurant is eco-friendly with a chilly atmosphere; the visitor center is equipped with books, fossil collections and other materials that are related with the forest and the entire eco-system. The lodge also has a gift shop. The grass-thatched bandas have been built in traditional Ugandan style for an authentic community experience on Uganda safari. They are encircled by lovely tropical gardens full of butterflies and weaver birds. Guests are free to spend some time in the gardens or visit the Kigaragara local community and explore the craft shop. Encounter Ugandan cuisine prepared by local women served in the restaurant, and in the warm evenings one can relax by the open air bar under the stars. 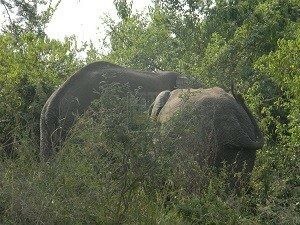 There are two routes that can be used to reach Murchison Falls National Park from Masindi. One is via Kichumbanyobo gate Masindi 85km about 2 – 3 hours’ drive while the other is via the Albertine rift 135km about 5 hours’ drive with impressive scenic views. Murchison Falls National park can also be connected to using public transport. The buses connect from Kampala to Masindi on a daily basis after which you can pick a private taxi to connect to the park for the remaining distance at a lesser cost compared to if you were to get it from Kampala. 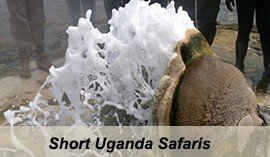 Murchison Falls National Park can also be accessed by Air travel. Aero link operates scheduled flights to Pakuba Airfield and Bugungu Airstrip from Entebbe International Airport. Other Charter airline carriers operate charter services from either Kajjansi Airfield or Entebbe Airport to Bugungu and Pakuba Airfields upon demand.